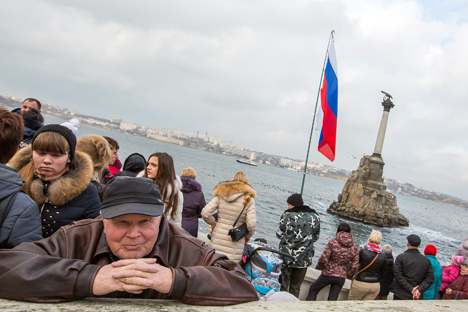 Is there really a climate of fear in Crimea? Amnesty International has released a report on the human rights situation in Crimea, timing it to coincide with the first anniversary of the peninsula’s takeover by Russia. The report speaks of abductions and torture, attacks on the media and NGOs, violations of the rights of Crimean Tatars. However, representatives of some local organizations do not agree with these findings. Human rights organization Amnesty International (AI) has published a 24-page report on the situation in Crimea. The authors of the document report numerous instances of human rights violations on the peninsula and say that over the past 12 months several people in Crimea have gone missing. According to the report, released on March 18, seven people have been abducted, including three Crimean Tatars, one of whom was found dead in spring last year with signs of torture on his body. The whereabouts of the remaining six people remain unknown. Yankov pointed to the fact that all the abducted people had one thing in common, their “pro-Ukrainian stance” and the fact that they had protested against Russia’s takeover of Crimea. Crimean Deputy Prime Minister Ruslan Balbek told RIR that the investigation is being carried out by the law-enforcement agencies, which are outside the supervision of the Crimean government. At the same time, Nimetullayev stressed that “Crimean Tatars were experiencing a lot of problems.” However, he continued, those problems have been caused by becoming part of a new state. The main difficulties are related to acquiring plots of land and registering them as one’s property. Ivan Garda, who heads the MIR Congress of Human Rights and Freedoms, which unites a group of socially-oriented NGOs, also says that the main problem being experienced by Crimean Tatars is related to obtaining land. Garda told RIR that about a quarter of all the cases that human rights activists of his NGO are dealing with are complaints from Crimean Tatars related to the allocation of land rather than political problems. According to Amnesty International, “the de facto authorities are creating a climate of fear in Crimea, using intimidation and restrictive laws to silence the media and NGOs.” Garda, speaking of his experience over the past 12 months, said that the authorities may be lacking understanding about how public organizations work, however, they do not hinder NGOs in their work and sometimes assist them.